He was the bowler who picked Sachin Tendulkar's wicket in his last innings in Mumbai. Cricket West Indies (CWI) has suspended the off-spinner Shane Shillingford from bowling with immediate effect due to his illegal action. This is the third time that the cricketer’s bowling action has been deemed illegal as an independent assessment revealed that his deliveries exceeded the 15 Degrees level of tolerance which is permitted under normal playing regulations. Shillingford was reported for suspect action during West Indies domestic four-day tournament’s first-round match in St Lucia. He finished the match with the figures of 5/115 as his team lost by 125 runs to Guyana. However, before his action was officially deemed illegal, the off-spinner had claimed six-wicket hauls in both the innings in the next round against Trinidad and Tobago. CWI released the statement revealing the news stating that Shane Shillingford will remain suspended until his action is found legal under the playing regulations of the cricket board. “Shillingford will remain suspended until his action is found to be legal, either by an opinion report from Loughborough University or by independent analysis from an accredited testing centre, in accordance with the CWI Regulations for Dealing with Suspected Illegal Bowling Actions,” the statement read. The 35-year-old is expected to undergo a change in his action now under the supervision of the Volcanoes franchise. After sorting out the same, he can apply for a re-assessment. This is not the first time though that Shane’s action is deemed illegal. He was suspended from bowling in December 2010 following independent analysis in Perth and was then cleared by the ICC in June 2011 after the bowler underwent remedial action. 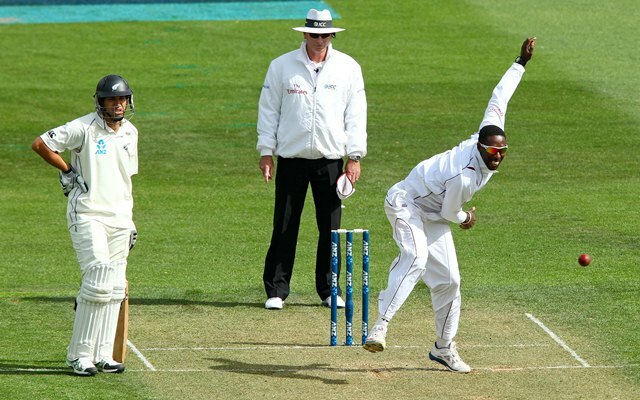 Unfortunately, he was again reported in 2013 during the team’s New Zealand and since then, Shane Shillingford’s career is at crossroads. So far he has played 16 Test for Windies picking 70 wickets at an average of 34.55 and now once again will be keen on coming back strongly.